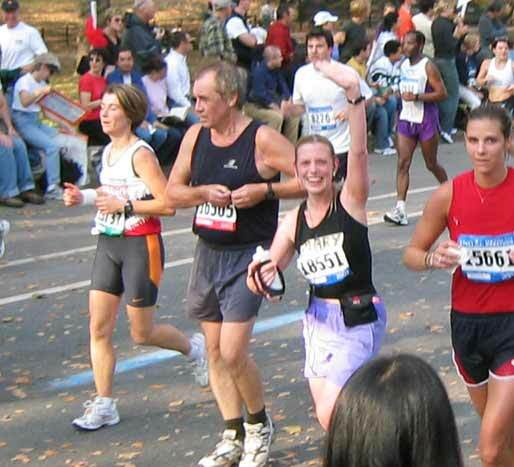 Here's a picture of my sister at mile 18 of the NYC marathon, looking sharp. Tonight after the show is Speaker's Corner, where some folks are going to speak with me on a panel after the show. It's an eclectic mix of people: Eric Berry, former Customer Service warrior, Glenn Fleischmann, tech pundit, writer and former early-era Amazonian and Scott Cole, an old friend of mine who is teaching at UW and specializes in oral performance forms and the mythology of the West. We'll talk with moderator Stephanie Coen, then take audience questions and so forth--should be fun. Stick around if you are coming to the show this evening.